Rain water Barrels aren't new, they have existed since ancient times. Many cultures have used captured rain water. Some are from the middle east, Meso-America and Ancient Rome used it to irrigate their plants. Collecting rain water can be traced back through human history almost as far back as the origins of agriculture. Ernest Hemingway relied on rain water barrels as a means of receiving fresh water. A great way to collecting rain water is using a rain barrel. 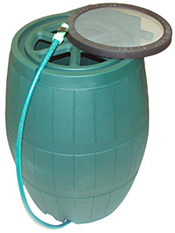 There are different, types of water barrel. Weather you choose wood or plastic as your rain barrel, always go for recycled materials as you will be saving the environment by doing so.It's no rocket science folks, if everybody does their part in everyday life weather it's earth day or not,recycling should be part of our everyday routine like eating and sleeping. Rain water barrels brings us back to basics, no need to reinvent the wheel here. If you need to water your garden, choose rain water barrels. Rain water barrels simply work by having a spigot at the bottom, it can either be connected directly to your gutter or can be securely covered with a screen mesh and placed under an area of your roof that beads off a lot of water. It is a fact that standing water can be a favorable place for mosquito's or Mosquito Hawks to lay their eggs.Keep the lid of your barrel secured with a screen mesh.Keep your barrel free of any organic material.To keep mosquito's out of the barrel, simply add one tablespoon of olive oil in your water.Keep children and pets away from the rain barrel. Other simple things you can do to prevent mosquito's in your garden is to plant mosquito repellant plants. This is a natural and fun way to keep those pesky critters away from standing water. Helps reduce peak water demand during those hot summer months.Applicable to all types of sites weather residential,commercial or industrial.Takes advantage of existing source of rainwater. - Use it to wash your car, boat, tools, windows and deck. 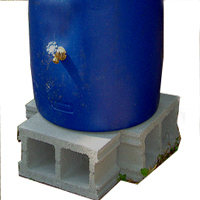 If you bought your rain barrel, it may come with a barrel stand, or if you're making your own, you can simply put cement blocks under the barrel on a straight surface. IF you want to make sure it's leveled properly, just use a horizontal leveling tool, easily found at your local hardware store. The reason for this is that a barrel full of water once its full can weigh up to 400 pounds! so it's very important to have the barrel stand on an even surface, you certainly don't want to have an accident and have the rain barrel tip over! Rain Water from barrels shouldn't be a concern unless you intend to consume it. PLEASE DO NOT use it as a potable water source. They should only be used for the garden and not to store it as drinking water. Before the winter, or in cold weather, take your rain barrel out of operation.DO NOT let water freeze inside your rain barrel as this will cause it to expand, possibly cracking your barrel, or hose. - Disconnect your rain barrel for the winter months. - Empty the rain barrel and store it in your basement, heated garage, or under your porch. If rain water barrels must remain outside, turn it upside down so it fully drains and remains clean and secure it with a concrete block or bungee cord. Like many other automotive products out there, the one I am about to recommend is environmentally friendly, non toxic, ammonia free, and biodegradable. As you would use it on a car to remove bugs, sap and grease, the same can be applied to rain water barrels. How : Weather your doing the inside or outside of the rain barrel, mist the rain barrel with your garden hose to wet it down, then spray it with Simple Green, and let it sit for a few minutes until the grease and residue come off. You can take a soft brush to remove any left over residue and simple hose down the rain barrel with water. To protect your rain barrel from the sun's harmful UV rays, you can use ArmourAll or similar product. How : Apply ArmourAll on your wet rain barrel and simply rub it with a soft cloth. Like the plastic dash on a car, it will add a protective layer against hot and cold temperatures giving you a lasting protection for years to come!